Sunday again. 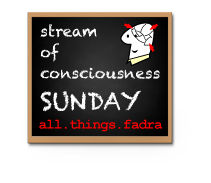 Stream of Consciousness Sunday again. And this time I was determined not to subtly cheat: to "forget" to set the timer or to pre-plan what I was going to say, writing in my mind so it was not TRULY stream of consciousness. Because me? I like to sound good. And so for me? Raw is scary. And what I wrote today? In a 4 AM insomniac moment? Scares me. I don't want to share it. Don't like how I come off in it. Am not the super-mom I want to be. Don't want you to see Jake in this light, want you to know this is not nearly all of who he is. But also? I am going to hit "publish" anyway, because if my friends like Adrienne can be brave and let stuff she wants no one to see leak out of her? So can I.
I am really struggling with this one: feeling guilty about how much I have fobbed Jacob off on others while I have been recovering from my Gall bladder operation earlier this month. It’s been almost 3 weeks now, life should be getting back to normal, which it nearly is, except for this… I am still handing Jake off to everyone else – his Dad, babysitters, etc. - far more than is my usual m.o. And I could say it’s because he gets so physical with me and I am worried about hurting, and that would be semi-true, but really? I need the break. I love Jake to pieces but he is exhausting. Talking about the same subjects over and over, being bored to tears entering his world with him or working up a sweat to drag him into mine. How many times can I listen to all the upcoming movies and their attendant opening dates (if you want to know when Cars 2, Rio, Rango, the Green Lantern, Cowboys and aliens, Kung fu Panda 2 are due to open this winter/spring/summer? Just ask me. I’ve heard it a thousand times.) Or to keep saying to Jake “No more movie talk, lets talk about something else,” only to have him veer back there after a whole minute talking about… his other favorite subject: our cat. I love our cat as much as the next person, but really, she’s a cat. The answer to Jake’s incessant question ”What’s cocoa doing, mommy?” Is 99% of the time “sleeping” although the more honest answer would probably be “Hiding from YOU, because you are obsessed with her.” This winter is killing me because we can’t just go for a walk in the park and I am in no shape for sledding and snowman building and when we sit around the house there is WAY too much screen time because it is easy: TVcomputerDS… I am SICK of them. So I fob him off & feel guilty, guilty, guilty. Sigh. Wow! It is unbelievably hard to resist the urge to break that up into little easily digestible paragraphs, as I have learned to do lately, making my blog more appealing to read. But I'm playing by the rules today, so this is me backing away, letting it stand as spewed.